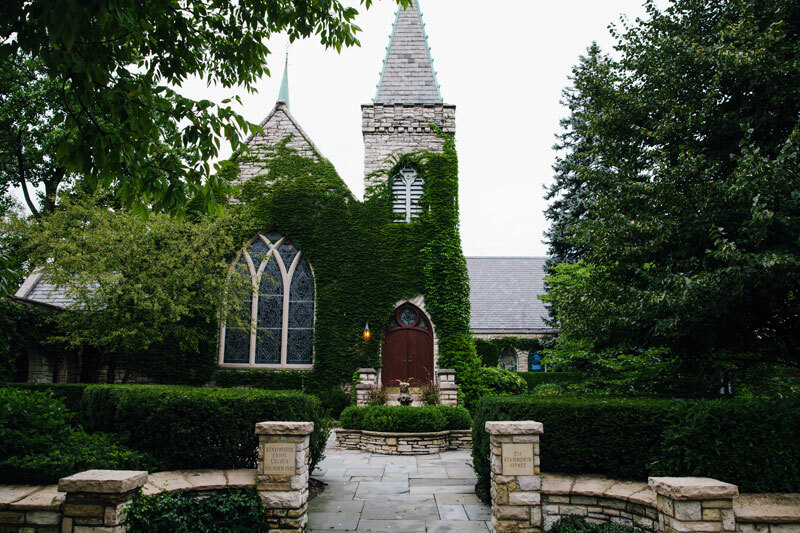 We're wrapping up design on our final invitations for the 2015 wedding season, and are already hard at work on our 2016 weddings! 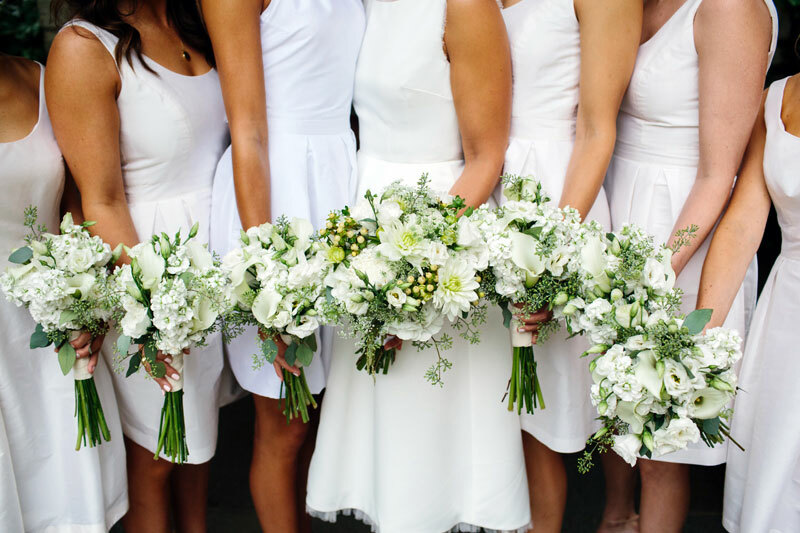 Our new batch of bride and grooms are already coming up with some beautiful ideas for their invitations that we can't wait to share. 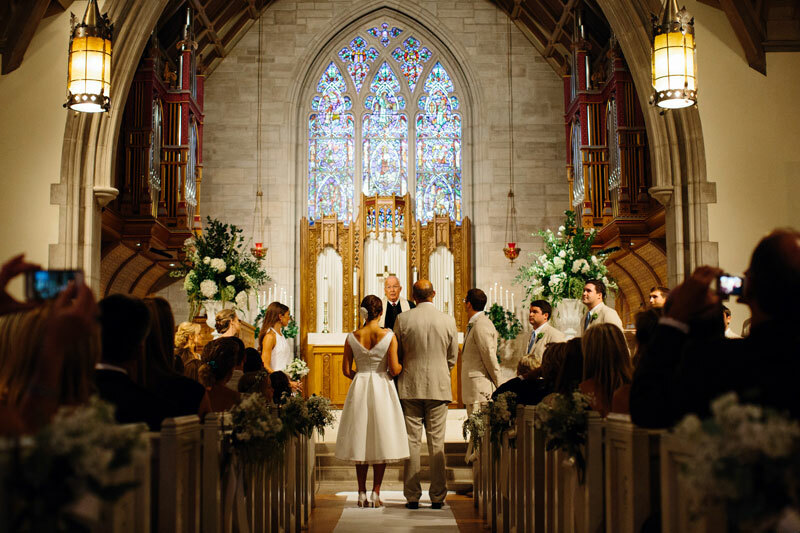 But with a new set of couples come questions about proper wedding invitation etiquette. 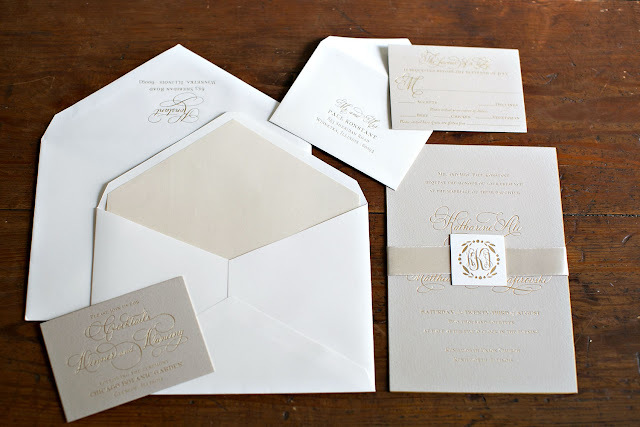 One of the more common wedding invitation etiquette questions being, "What are inner and outer envelopes? Do I really need double envelopes?" 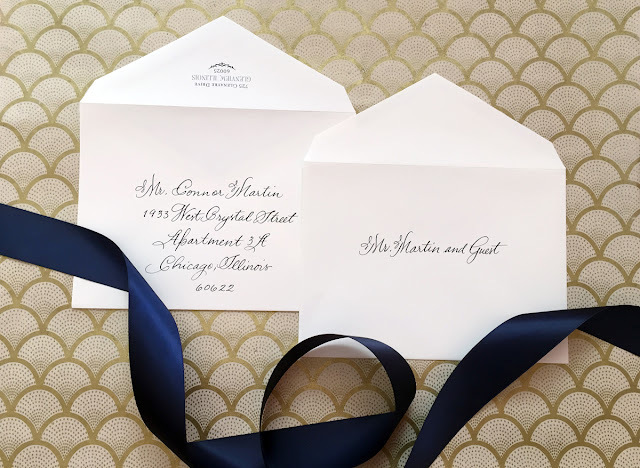 So today, we're sharing some of our wedding etiquette knowledge about inner and outer envelopes for wedding invitations! The tradition of sending out wedding invitations in double envelopes (the inner and outer) dates back to the early 1800's when mail was delivered on horseback and by foot. As you can imagine, traveling many miles in all sorts of weather conditions led to envelopes becoming dirty or torn. So it became proper etiquette to deliver wedding invitations inside double envelopes (the smaller "inner" envelope, and the slightly larger "outer") to protect the inner envelope and ultimately, the wedding invitation. 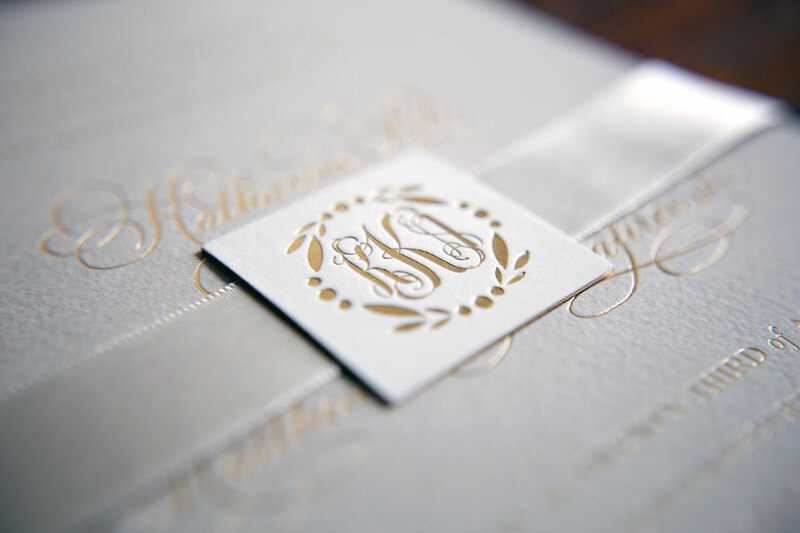 When the invitation was delivered, the outer envelope was removed, revealing a clean inner envelope holding the wedding invitation. Besides one envelope being smaller, and the other slightly bigger...how do these two envelopes differ? 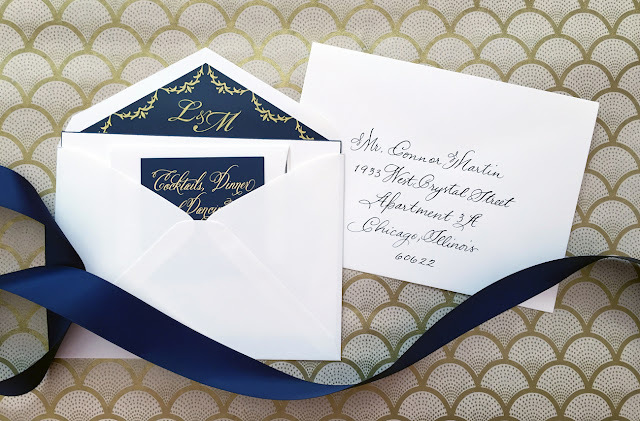 The larger, outer envelope contains full mailing information so that the postal service may deliver your invitation. Printed on the front of the envelopes are the guests' formal names and titles, their street address, city, state, and zip-code. 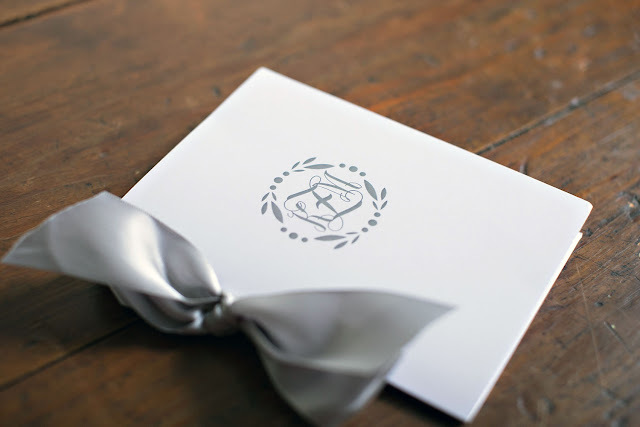 On the back flap of the outer envelope is your return address information, so that if an invitation is undeliverable, the post office may return it. The smaller, inner envelope is an ungummed envelope (as opposed to the sealable, gummed outer envelope) and is left unsealed inside of the larger envelope. The front of the inner envelope is informally addressed, and only includes your guests' names, no address. 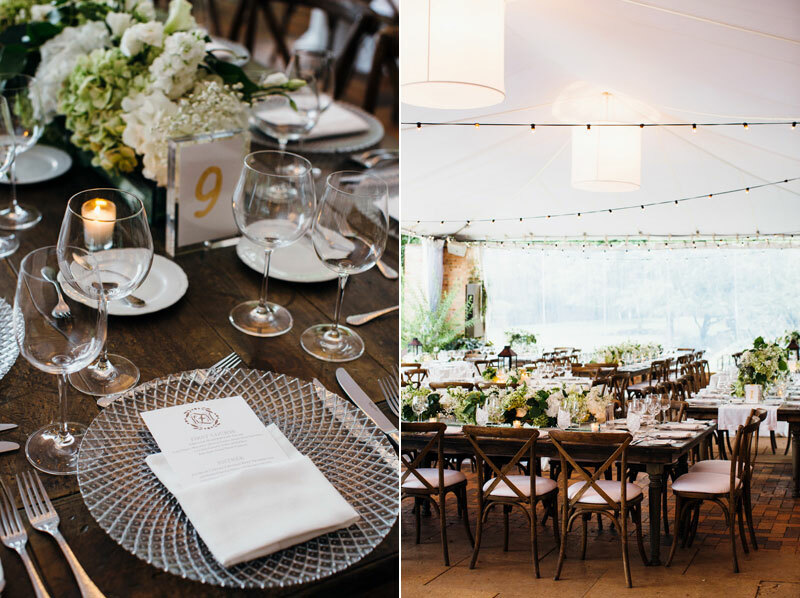 If additional guests are invited (e.g. 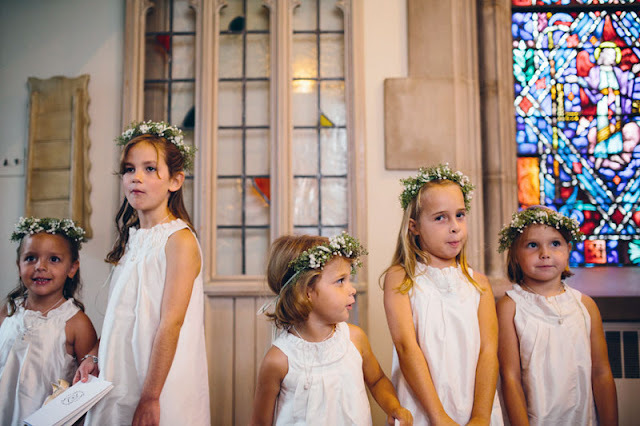 a "plus one" or children), that would be indicated on the inner envelope. If a couple chooses to include an envelope liner, the inner envelope is the envelope that gets lined. 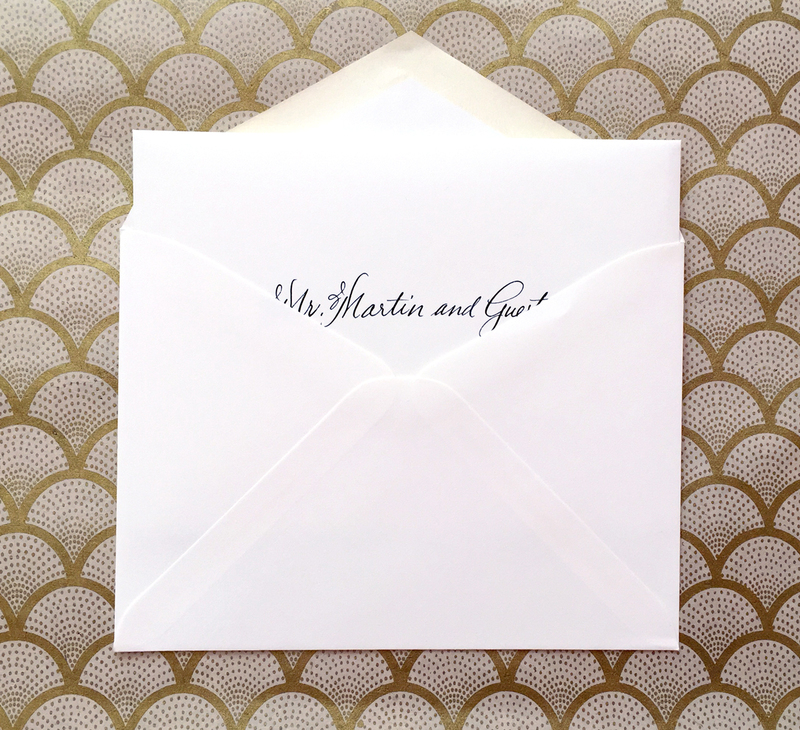 Lining the inner envelope allows your liner to really shine since the inner envelope is ungummed. 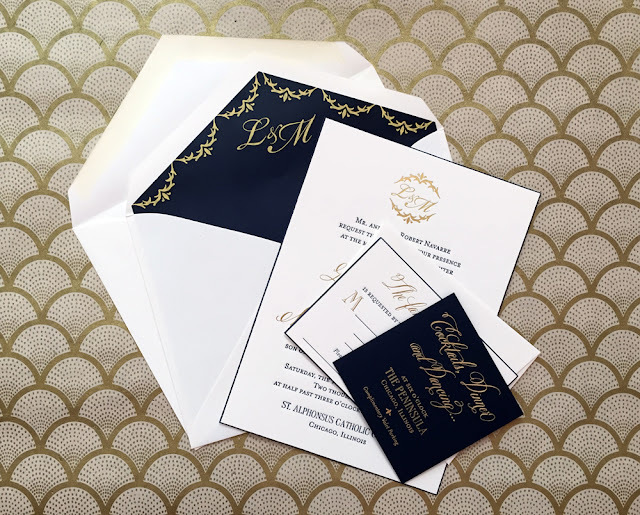 The tradition of double envelopes for wedding invitations is still alive and well, with many couples choosing to include both inner and outer envelopes in their wedding invitations. 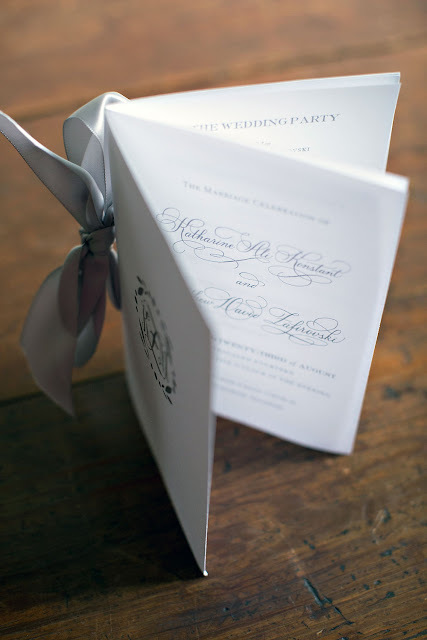 In today's modern age, we still have some of our mail arrive ripped and dirty (thank you, USPS), so the double envelope still does the job of protecting your wedding invitation. 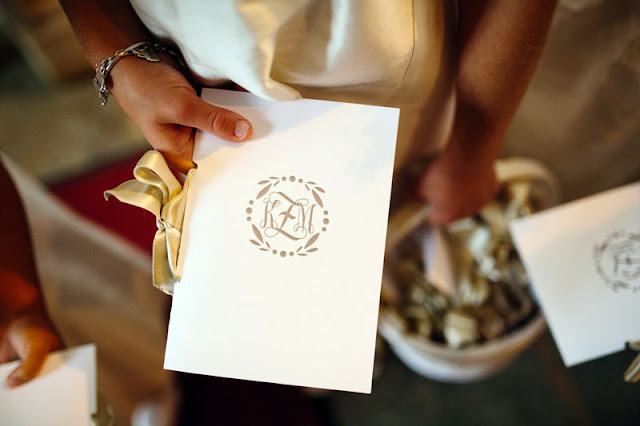 Some couples choose to omit the inner envelope, and send their wedding invitations in a single envelope. 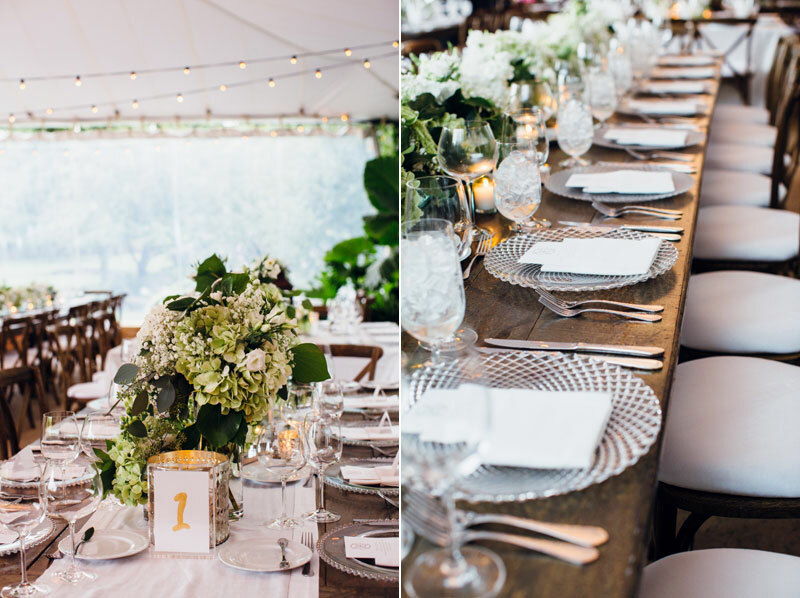 Both practices are proper when it comes to wedding etiquette, it's up to the individual couple to decide their preference! 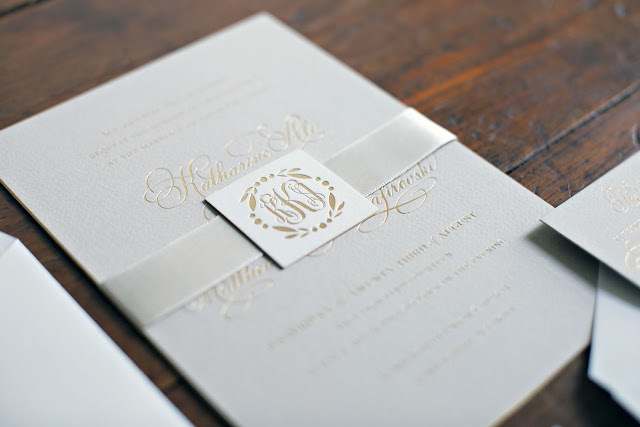 So now you're an expert on inner and outer envelopes for wedding invitations, too! There's no better way to start the week than with babies, right? 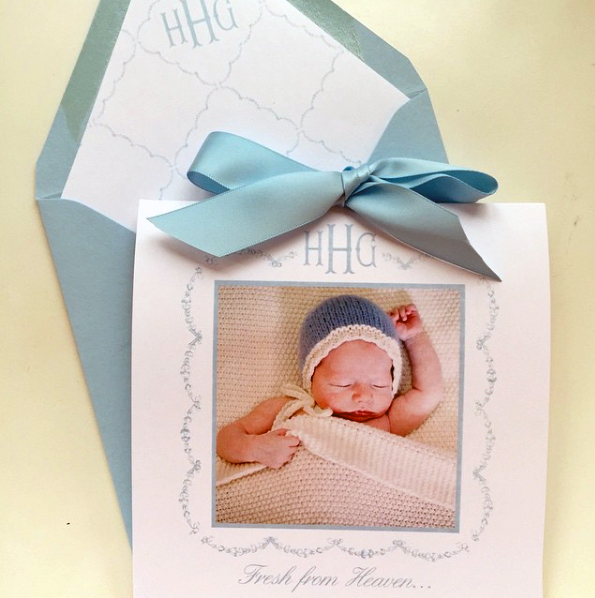 Our clients have had somewhat of a baby boom over the past few months, so we've had adorable birth announcements flying out of our studio door. 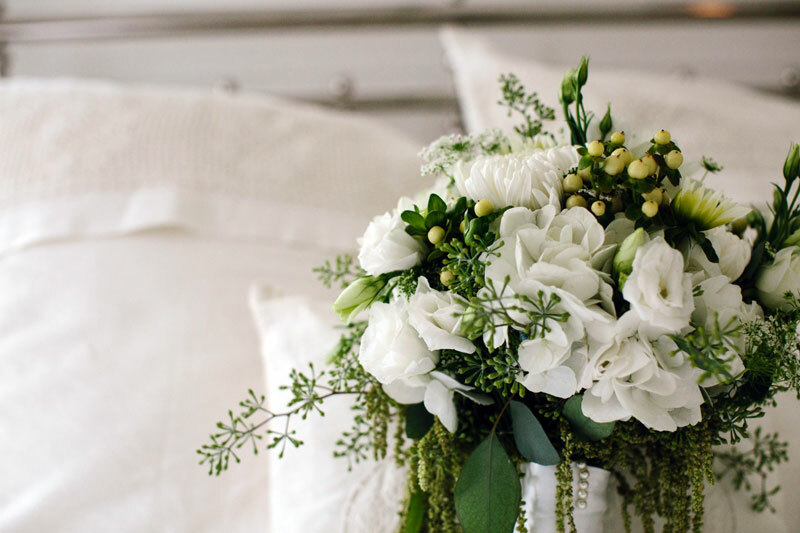 From the theme of the baby's nursery to taking inspiration from the baby's name, we design birth announcement s that are truly unique to our client's new baby. We love when our clients come to us with unique sources of inspiration...it makes our job that much more fun! 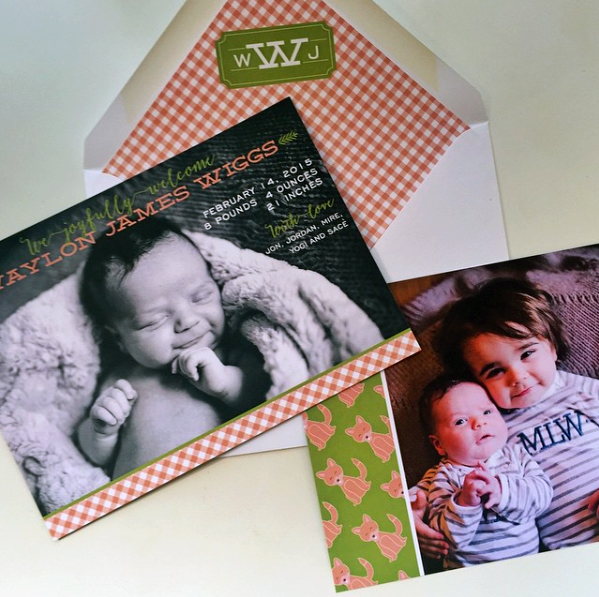 So we're starting our Monday morning by sharing some custom birth announcements, and the even cuter babies featured on them. 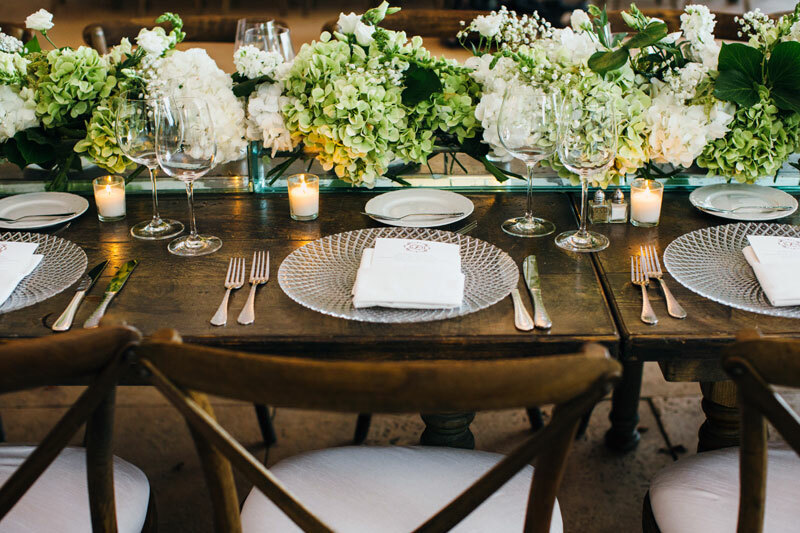 Take a peek at some of our custom creations below! 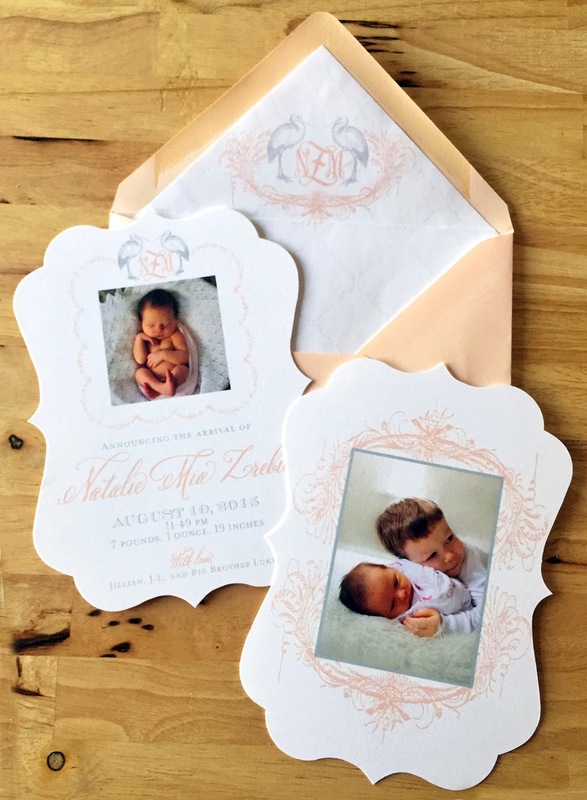 Natalie's custom birth announcement was inspired by the soft pink and French blue colors of her nursery and featured a unique die-cut shape, a stork inspired monogram, and pictures of her and her big brother. 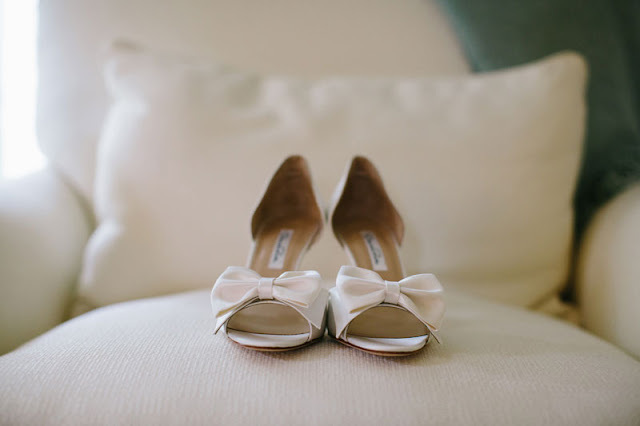 We love how elegant (and sweet) her announcement turned out! 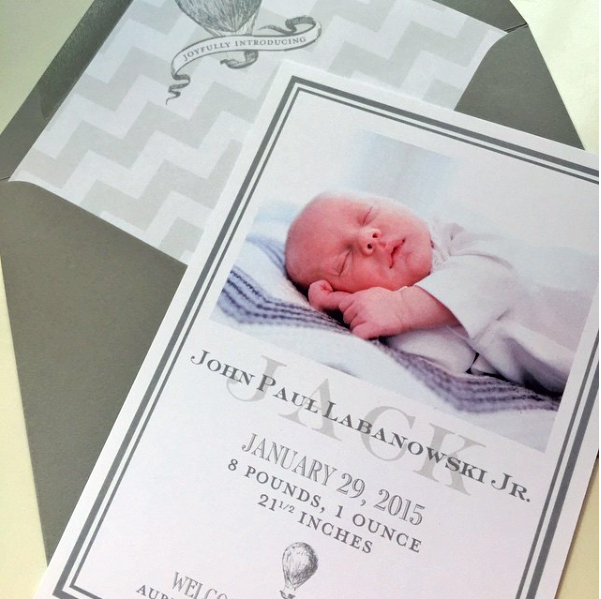 One of our favorite custom birth announcement creations, for our swanky, little client! 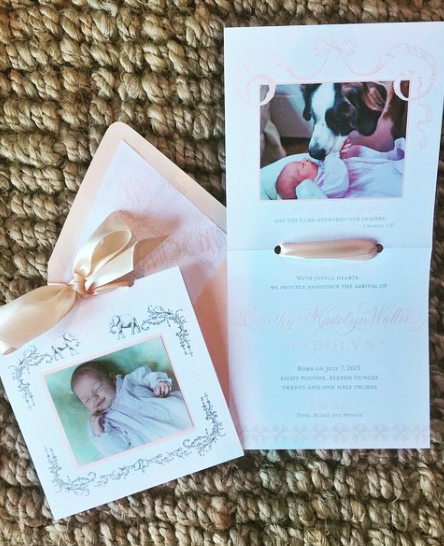 Madolyn's birth announcement was printed in pink and gray thermography and featured beautiful accents including a satin bow, her name written out in calligraphy, and of course...elephants. 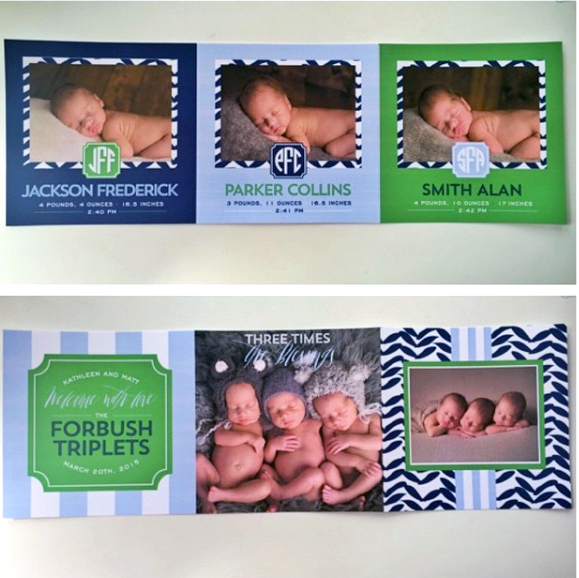 This tri-fold design worked perfectly for this custom birth announcement for triplets! How cute are these boys? Isn't looking at sweet birth announcements a great start to a Monday morning? 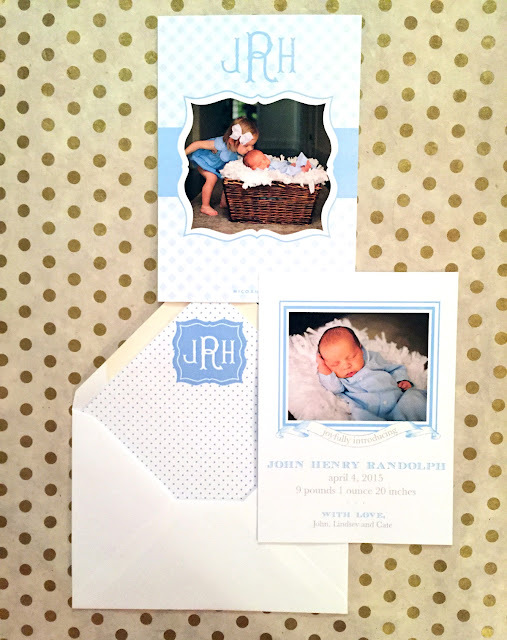 Custom birth announcements are always one of our favorite projects to work on. 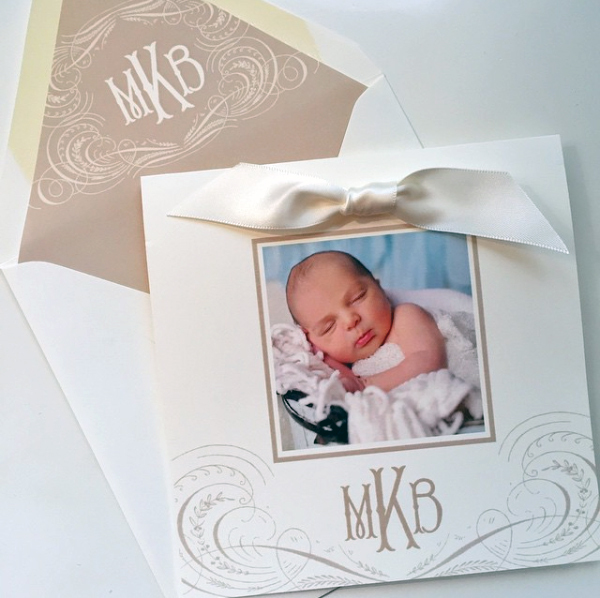 In need of a custom birth announcement for your new addition? E-mail us at custom@nicoandlala.com to get started. 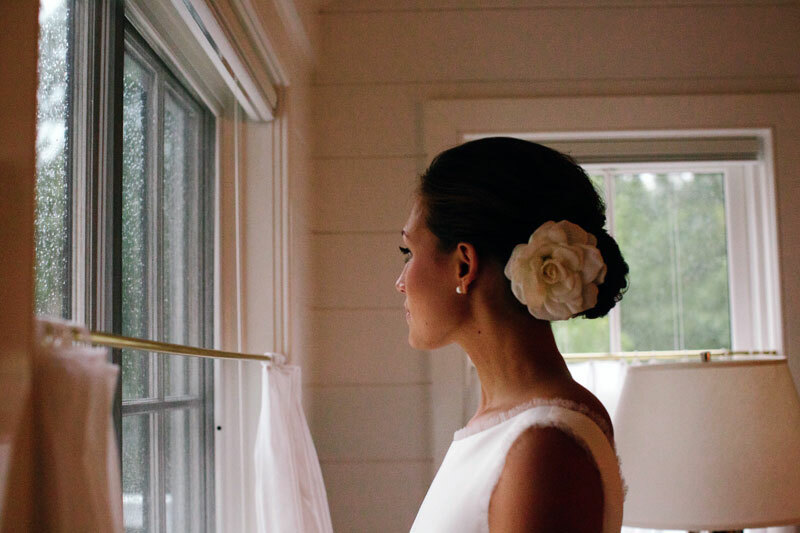 There's an old saying that rain is good luck on your wedding day. 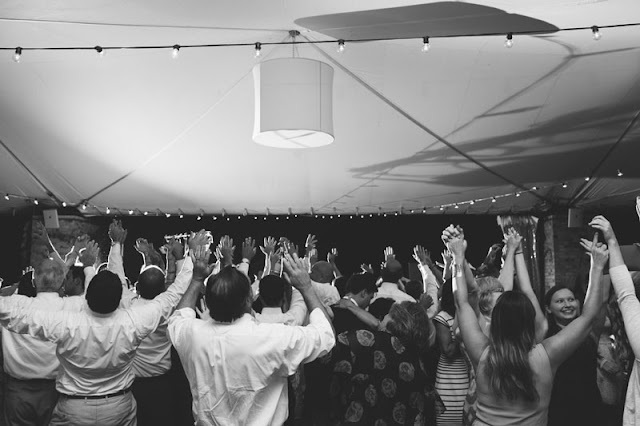 In Kali and Matt's case it was more than good luck, it was great luck and helped create some unforgettable memories. 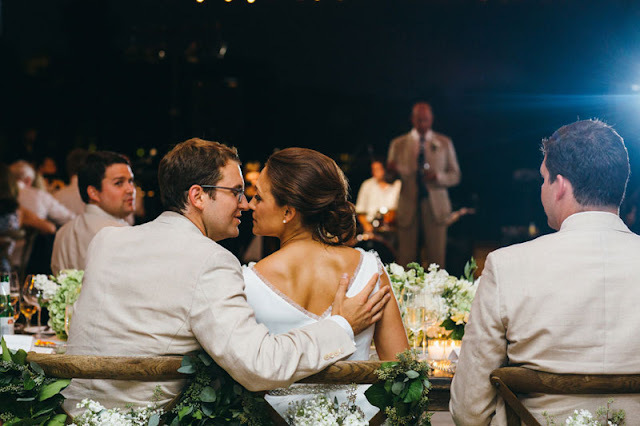 This sweet couple got married last August in an elegant end-of-summer wedding. 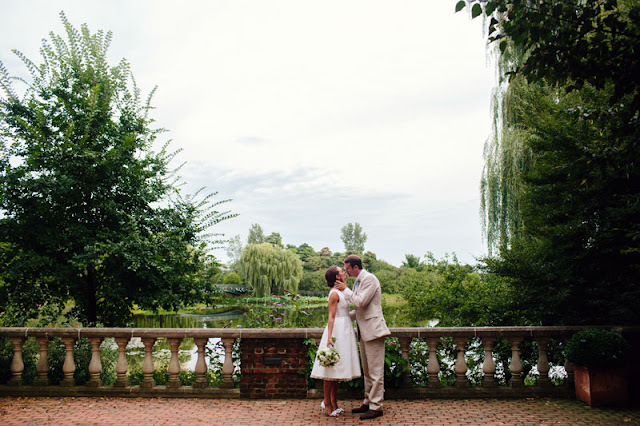 Held on the North Shore of Chicago at the Chicago Botanic Garden, their wedding was the perfect mix of classic elements, lush floral arrangements, and the most beautiful garden setting. 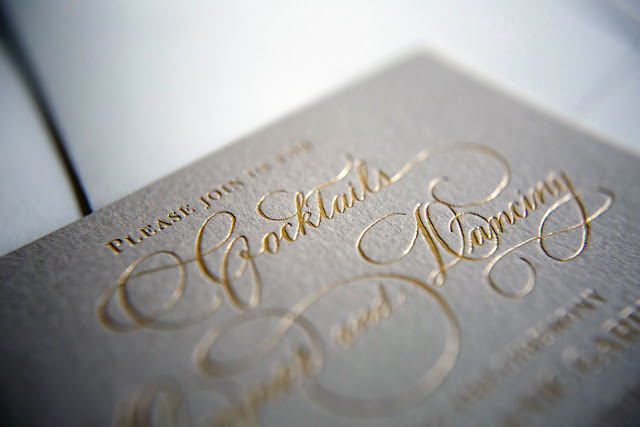 For Kali and Matt's save the dates, they wanted to keep the design both classic and elegant, with a subtle modern twist. So when choosing fonts, we choose to highlight a beautiful script font along with a more modern block font. 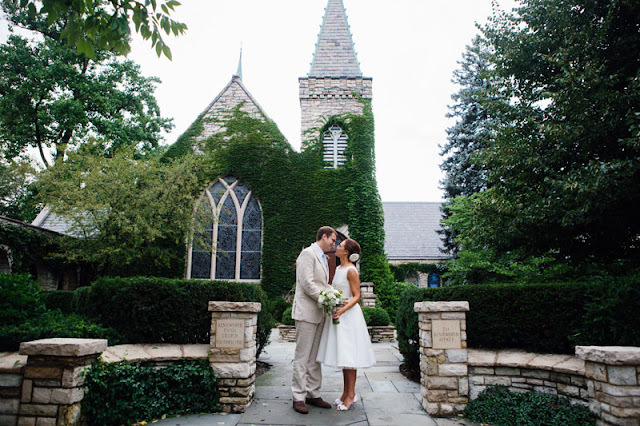 Their square-shaped save the date was mounted to a stone grey paper, which gave their design a slight border. 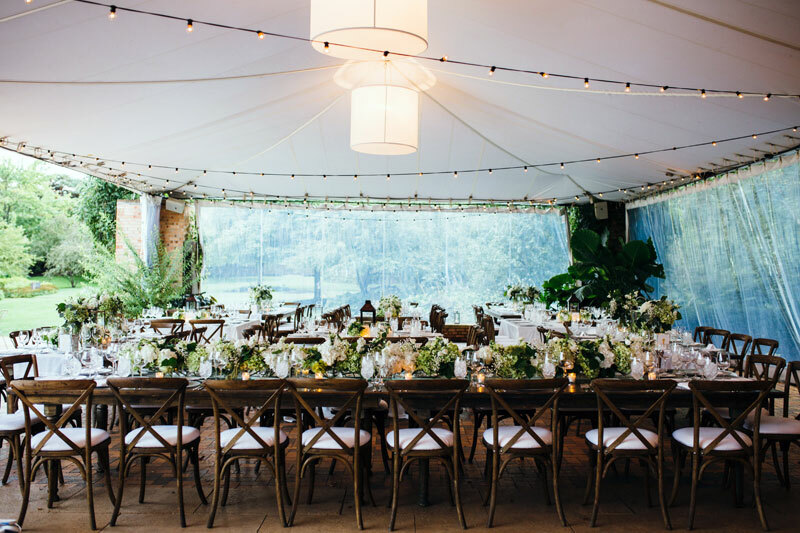 We also created a coordinating wedding website so that Kali and Matt's wedding guests could easily access information about their wedding weekend! 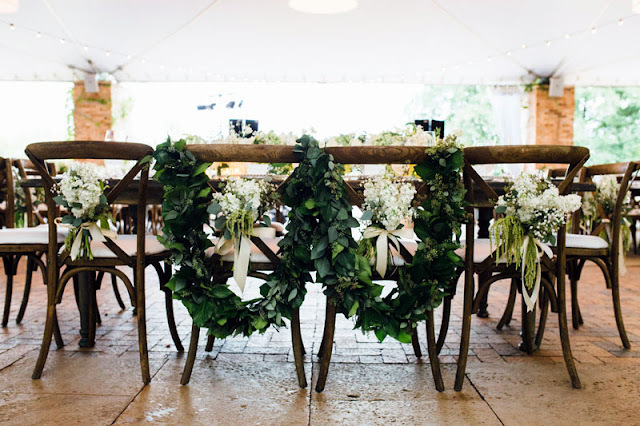 Their website included information about the wedding party, a schedule of events for their wedding weekend, a photo gallery, and a link to their wedding registry. 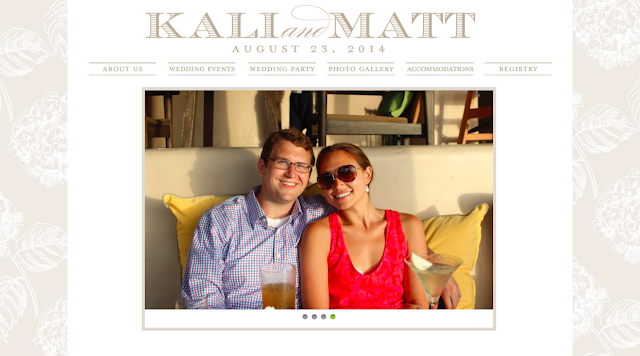 To take a peek at Kali and Matt's wedding website visit www.kaliplusmatt.com. In keeping with Kali and Matt's classically elegant theme, we kept colors neutral for their wedding invitations. Printed in gold foil, their invitation mixed calligraphy with a block font, giving their traditional wedding invitation a modern twist. 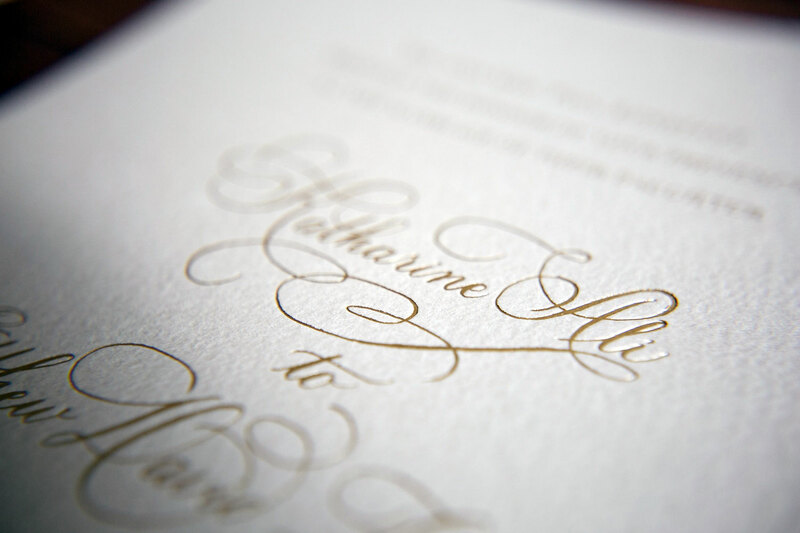 The sides of their stone colored invitation were both gilded and beveled, adding a luxurious touch to their custom invitation. Their invitation ensemble, which also included a reception card and a reply card, was wrapped in a champagne colored ribbon, and was sealed with Kali's custom wedding monogram. Kali and Matt's wedding program featured the couple's custom wedding monogram printed in thermography on the front cover, and was bound with a satin bow. 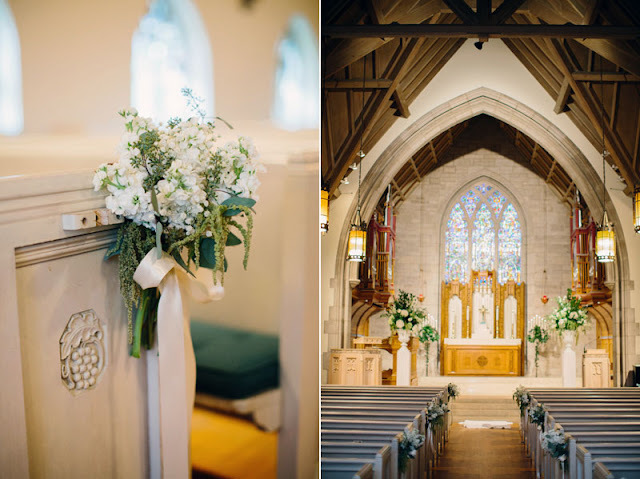 Kali and Matt's ceremony was held at the historic (and incredibly quaint) Kenilworth Union Church. 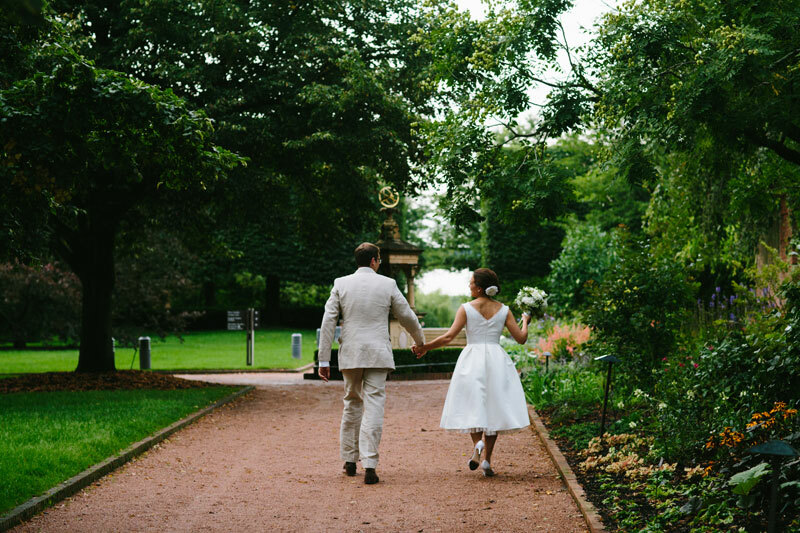 Kali's wedding dress has us envisioning Jackie O. with its classic, tea-length design. We love how all of her bridesmaid's matched her in their white, short dresses. The neutral color palette is such an elegant choice, and really let the garden scenery of their wedding shine! 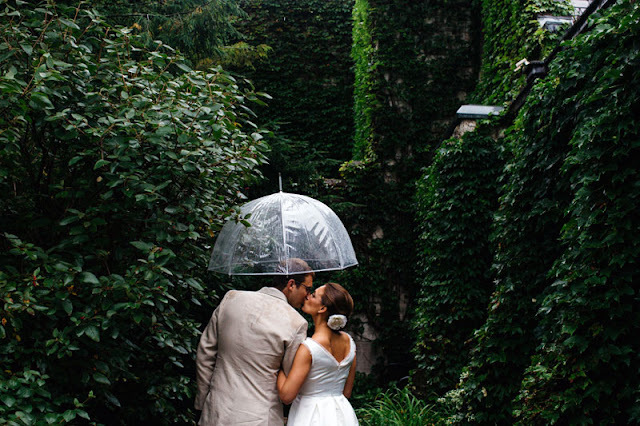 The rain following their ceremony not only provided the couple with good luck, but a great photo opportunity held in the gardens at the church. 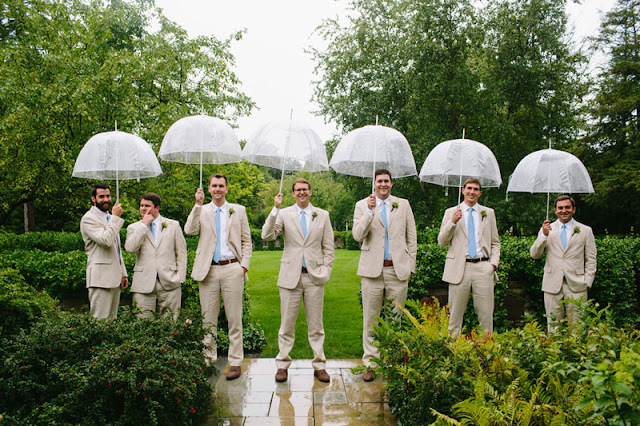 We love the adorable umbrellas! 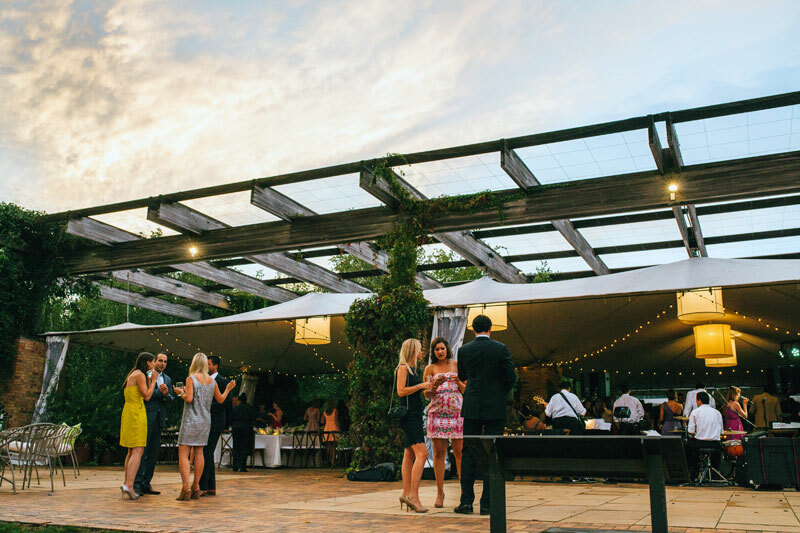 After the rain cleared, Kali and Matt's guests headed to the Chicago Botanic Garden to celebrate late into the night with cocktails, dinner, and dancing. The Botanic Gardens played the perfect backdrop to their elegant garden wedding reception. 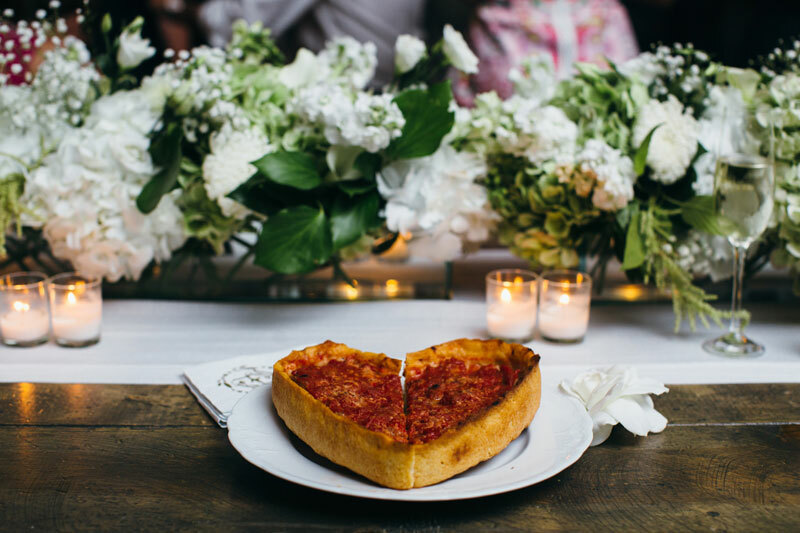 No Chicago wedding is complete without a Chicago deep-dish pizza in the shape of a heart! 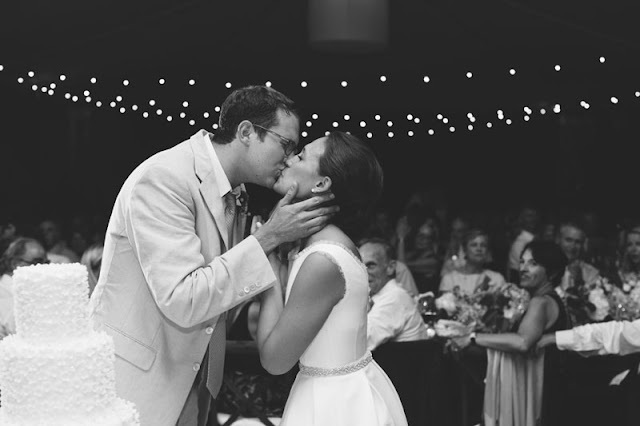 Congratulations to Kali and Matt, who just celebrated their first anniversary last month! 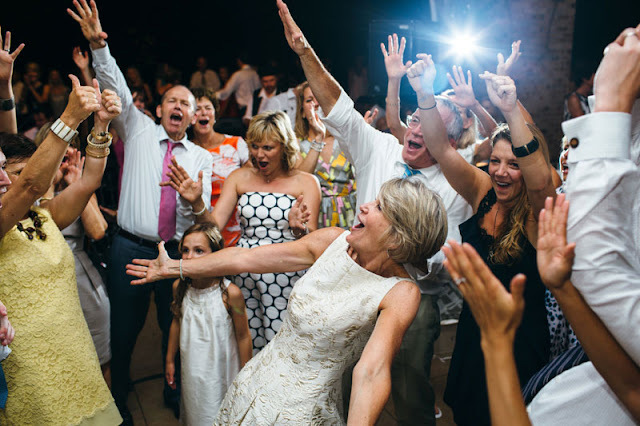 We are so happy we got to be part of their special day! Mermaids Under the Sea Birthday!